In From Holmes to Everyone knows Sherlock Holmes. Sir Arthur Conan Doyle created a unique literary character who has remained popular for over a century and is appreciated more than ever today. But what made this fictional character, dreamed up by a small-town English doctor in the 1880s, into such a lasting success, despite the author’s own attempt to escape his invention? To ask other readers questions about From Holmes to Sherlock, please sign up. So you’ve read all the Sherlock Holmes stories by Arthur Conan Doyle. You’ve enjoyed the vintage art of Sidney Paget and Frederic Dorr Steele that helped shape the image of Sherlock Holmes. You’ve watched Basil Rathbone in 14 films and maybe heard some of the radio plays written and produced by Edith Meiser. You’ve watched all the television episodes featuring Ronald Howard, Douglas Wilmer, Peter Cushing, Jeremy Brett, Benedict Cumberbatch or Jonny Lee Miller. You were astounded when the long th So you’ve read all the Sherlock Holmes stories by Arthur Conan Doyle. You’ve enjoyed the vintage art of Sidney Paget and Frederic Dorr Steele that helped shape the image of Sherlock Holmes. You’ve watched Basil Rathbone in 14 films and maybe heard some of the radio plays written and produced by Edith Meiser. You’ve watched all the television episodes featuring Ronald Howard, Douglas Wilmer, Peter Cushing, Jeremy Brett, Benedict Cumberbatch or Jonny Lee Miller. You were astounded when the long thought lost 1916 film ‘Sherlock Holmes’ with William Gillette was rediscovered and released to DVD a couple years ago. You may have read biographies of Arthur Conan Doyle, touching on his inspiration for Holmes via Joseph Bell, or his investigation of real life crimes, or guides to the actors who have played Holmes, or perhaps some of the beautifully illustrated surveys detailing art and artifacts associated with Sherlock Holmes. You may have heard about the Baker Street Irregulars and the role of Vincent Starrett, Christopher Morley and others in their establishment, read their publication The Baker Street Journal, the involvement of Presidents Franklin Delano Roosevelt and Harry S. Truman, or know something about the squabbles between Doyle’s heirs and the BSI, or that the BSI didn’t allow women members until 1991. You may be a member of a local Sherlock Holmes scion society or book club. You’ve probably read any number of published pastiches including Ellery Queen’s The Misadventures of Sherlock Holmes or Nick Meyer’s game changing The Seven-Per-Cent Solution, Mitch Cullin’s A Slight Trick of the Mind, or more recent anthologies by Laurie King and Les Klinger, the last of which resulted in a huge public court case firmly putting the character (if not all the stories) of Sherlock Holmes in the public domain. You may have listened to podcasts by the Baker Street Babes celebrating the remarkable international success of the BBC’s Sherlock, or attended one of the conventions, all of which have contributed to a global popularity, shift and resurgence in one of the oldest fandoms ever encountered. Hell, you are probably even familiar with the ubiquitous tent joke. Or maybe you’ve not read or seen any of it and just have some vague curiosity about Sherlock Holmes? In any event, what you’re probably wondering is how can I see the ‘big picture’? How does it all fit together? How does a simple detective character, created in 1887, manage to stay in the public eye and be a pop culture sensation, taking the world by storm, some 130 years later? Mattias Boström’s unique, incredibly ambitious and wide ranging volume ‘From Holmes to Sherlock: The Story of the Men and Women Who Created an Icon’ aims to answer that question. This isn’t a straight-up history, nor is it a biography of any one individual, instead it is an examination of the entire Sherlock Holmes phenomenon; tracing the steps from inception in the mind of Arthur Conan Doyle right through to the people and events that shaped the latest film and television extravaganzas, all presented in a chronological narrative form. The book is exactly what it claims to be in the subtitle, it is literally ‘The Story of the Men and Women Who Created an Icon.’ By utilizing the narrative story form, rather than a dry historical format, Boström makes the reader part of the events as they unfold and gives us a better sense of the key players as what they are, or were; real live human beings with all the foibles, quirks and flaws that implies. While it reads like a work of fiction, almost a literary mystery, it is a rich tapestry, filled with real-world heroes and villains, and Boström, using a wealth of facts as foundation (Boström and Matt Laffey have been exhaustively researching newspaper archives for mentions of Holmes and Conan Doyle for a series of books, currently up to three volumes, called ‘Sherlock Holmes and Conan Doyle in the Newspapers’, published by Wessex Press), extrapolates and provides us with scenes that make us privy to the thoughts and motivations behind their actions. The chatty, almost gossipy style, is engaging, almost deceptively masking the wealth of information the reader is being handed, but never loses the thread of the story at its heart. While you will meet an almost bewildering array of people and cover 130 years worth of events, vignettes, tales of greed and heartbreak, Boström puts it all together in a cohesive form that is never less than compelling and will have you turning pages at the pace of a Dan Brown thriller. Whether you’re familiar with the elements of the history of Sherlock Holmes in print and media, or a complete newcomer, I guarantee you’ll learn something new in this monumental work that explores the ‘big picture’ of the Sherlock Holmes phenomenon and how it came to be. Bottom line: I cannot recommend this highly enough, as ‘From Holmes to Sherlock: The Story of the Men and Women Who Created an Icon’ is likely the most important work connected to Sherlock Holmes to be published in 2017 and a must-read for anyone with an interest in the character, the history or the fandom surrounding him. Note: Review based on an uncorrected proof provided on January 7, 2017. As such no remarks regarding typos (there aren't many) or irregularities in style (this work has been translated from Swedish) have been noted in this review as they may be corrected before publication. The perfect book for any person interested in Sherlock Holmes and/or Sir Arthur Conan Doyle. I first got into Sherlock Holmes through fanfiction. Not written fanfiction about Sherlock Holmes; I was researching fanfiction for a small uni paper and Sherlock Holmes came up. When Sir Arthur Conan Doyle decided to *spoilers* kill his detective, the public went crazy and came up with all sorts of theories and ideas as to how he could have survived the Reichenbach Fall (sound familiar?). Then I started watching some of the movies and the Moffat&Gatiss tv-show (which is brilliant beyond imagining) and read some of the short stories. And that's the road I'm continuing on with this one! Now this book is written in an incredibly interesting and captivating way. It's not like with most thick biography-like books where you feel like you can sort of skip a few lines and still get the picture - I actually tried to do that with this book on several instances and found that it was impossible. The text just draws you in and keeps you there - and you learn a heck of a lot about Sir Arthur Conan Doyle, his family and the phenomenon that they created. Firstly this book is really good. The author has done a splendid job on it. I thoroughly enjoyed reading it. It starts with a trainride. The book starts with telling the story about how 2 men( Steven Moffat and Mark Gatiss) came up with the idea about how to bring Sherlock into modern times. Ok so this book is a biography about both Arthur Conan Doyle and Sherlock Holmes. It takes us from Sherlocks beginnings and towards the awesome tvseries Sherlock. It is a really interesting read if you're a Firstly this book is really good. The author has done a splendid job on it. I thoroughly enjoyed reading it. It starts with a trainride. The book starts with telling the story about how 2 men( Steven Moffat and Mark Gatiss) came up with the idea about how to bring Sherlock into modern times. Ok so this book is a biography about both Arthur Conan Doyle and Sherlock Holmes. It takes us from Sherlocks beginnings and towards the awesome tvseries Sherlock. It is a really interesting read if you're a Sherlock Holmes fan like me, or if you just want to know more about one of literatures greatest characters. The game is afoot and we are taken into the lives of Conan Doyle and Sherlock Holmes in this chock full of information guide to their lives (Sherlock Holmes was real, wasn't he?). And what a joy it is. The author has done some fine research on the beginnings of the Homes saga through the latest iteration of the character through television. The beginning of the book covers the life of Conan Doyle and how he decided to give up his medical practice and become an author. Little did he know that he w The game is afoot and we are taken into the lives of Conan Doyle and Sherlock Holmes in this chock full of information guide to their lives (Sherlock Holmes was real, wasn't he?). And what a joy it is. The author has done some fine research on the beginnings of the Homes saga through the latest iteration of the character through television. The beginning of the book covers the life of Conan Doyle and how he decided to give up his medical practice and become an author. Little did he know that he was developing an iconic character who would continue to hold the attention of world readers through the present day. Since this is really not a biography of Conan Doyle, the book moves quickly to the life of the books/short stories/plays/radio programs/ film and how the stories were developed, marketed, and eventually disliked by their author. As readers of Holmes books know, Conan Doyle tried to kill off Holmes which caused such public outrage that the character had to be brought back to life in a rather unconvincing way (IMHO). Sometimes I will be reading reviews and see a 1 or 2-star rating on a book that has won an award and I'll wonder how the reviewer could possibly give a low rating to an award winning book. How could he swim against the tide that way? A team of judges had decided that the book was in some way superior to other books of its type so how could this reviewer have formed any other opinion? Now I know. The first thing I noticed was that this book is lacking a table of contents. Whose idea was it to des Sometimes I will be reading reviews and see a 1 or 2-star rating on a book that has won an award and I'll wonder how the reviewer could possibly give a low rating to an award winning book. How could he swim against the tide that way? A team of judges had decided that the book was in some way superior to other books of its type so how could this reviewer have formed any other opinion? Now I know. The first thing I noticed was that this book is lacking a table of contents. Whose idea was it to design a non-fiction book without a table of contents? I found it annoying that so many chapters started as if that chapter were the beginning of an entirely different book, leaving the reader to flounder around over and over again getting oriented to the start of a new story. And each incident was presented like a story -- as if the author had been a fly on the wall across time and space. Not that the author skimped on his research, there were copious end notes, but when a character had a specific thought or private conversation, I could't help thinking that much of it had been fabricated for the sake of the story. A goodly chunk of the book is taken up by a rose-colored biography of Arthur Conan Doyle. This chunk is either too long or too short. While Conan Doyle was the creator of the great detective and the man who started it all, considering that the book is attempting to cover the entire Sherlock Holmes phenomenon, there are an awful lot of pages covering just the first era. On the other hand, that section was too short to offer a true full-length biography like The Adventures of Arthur Conan Doyle: A Biography or Teller of Tales: The Life of Arthur Conan Doyle. There are 8 glossy pages of small photographs in the middle of the book. I would have settled for just nice non-glossy pages if there had been a few more of them, maybe a little bigger, and they had been distributed thru the book with the relevant text pages. page 472 "When accessibility to computers and the Internet rose in the late 1990s and early 2000s, most of these fan activities ended up online." When I started posting fan web pages in 1997 it was already starting to feel old hat and I remember a lot of fan fiction online much earlier than that. In diesem Buch wird die komplette Geschichte Sherlock Holmes reflektiert. Es fängt an mit der Schaffung des Detektivs durch Conan Doyle bis hin zur aktuellen Serie Sherlock von der BBC. Es wird also das komplette Spektrum von Sherlock beleuchtet und es geht also nicht nur um den Kanon sowie die 4 Romane. Das Buch hat mir sehr gut gefallen, da ich wirklich viel erfahren habe, was ich noch nicht über Sherlock Holmes wusste. Selbst die Informationen über die Conan Doyle Nachfahren und wie sie versuch In diesem Buch wird die komplette Geschichte Sherlock Holmes reflektiert. Es fängt an mit der Schaffung des Detektivs durch Conan Doyle bis hin zur aktuellen Serie Sherlock von der BBC. Das Buch hat mir sehr gut gefallen, da ich wirklich viel erfahren habe, was ich noch nicht über Sherlock Holmes wusste. Selbst die Informationen über die Conan Doyle Nachfahren und wie sie versucht haben den literarischen Nachlass weiter zu verwalten waren kein bischen langatmig. Sherlock Holmes is the most popular fictional character of all time. “From Holmes to Sherlock” is written by Mattias Bostrom, a Holmesian (or a Sherlockian) and is translated by Michael Gallagher. “From Holmes to Sherlock” is a book that reveals the story behind the character ‘Sherlock Holmes’ – the inspiration, the creation and the evolution over the last 130 years or so. We get to hear the stories of the people involved, their lives and death, motivations, feuds and collaboration. GNab I received a free electronic copy of this work from Netgalley, Mattias Bostrom, and Grove Atlantic - Mysterious Press in exchange for an honest review. Thank you all for sharing your hard work with me. This history of the evolution of Sherlock Holmes and John Watson from conception in the late nineteenth century through the films and television serials of the twenty-first is extraordinary. At times it seemed extremely long, but I can't imagine anything that could be cut without harming the GNab I received a free electronic copy of this work from Netgalley, Mattias Bostrom, and Grove Atlantic - Mysterious Press in exchange for an honest review. Thank you all for sharing your hard work with me. This history of the evolution of Sherlock Holmes and John Watson from conception in the late nineteenth century through the films and television serials of the twenty-first is extraordinary. At times it seemed extremely long, but I can't imagine anything that could be cut without harming the whole. And it is whole. All of the parties tasked with continuing the stories of Holmes and Watson, with interpreting the original stories into new mediums, with holding the essence of Doyle's vision, have worked these many decades to maintain the course true. Holmes and Watson were the first fictional characters to outpace their author in name recognition and general acceptance. They are still recognized around the world and continue to be mistaken for persons living and breathing. Fans young and old still find their stories in whatever medium available to be challenging and deeply interesting. Bostrom and Gallagher's From Holmes to Sherlock (Mysterious Press 2017) is a thorough and detailed account of the life and adventures of Sir Arthur Conan Doyle and his iconic detective, Sherlock Holmes. In fact, at 608 pages, it is one of the longest biographies not about scientists or historic figures I've ever read. Besides being a fascinating account of Doyle's creation of the character many swore was alive, it is also a fascinating exploration of publishing and a writers life in the late 180 Bostrom and Gallagher's From Holmes to Sherlock (Mysterious Press 2017) is a thorough and detailed account of the life and adventures of Sir Arthur Conan Doyle and his iconic detective, Sherlock Holmes. In fact, at 608 pages, it is one of the longest biographies not about scientists or historic figures I've ever read. Besides being a fascinating account of Doyle's creation of the character many swore was alive, it is also a fascinating exploration of publishing and a writers life in the late 1800s-early 1900s. "Most of Conan Doyle’s stories followed a defined template. Usually they began with Sherlock Holmes and Dr. Watson each sitting in an easy chair in the flat at 221b Baker Street. A client would arrive and be received by the landlady, Mrs. Hudson. Sherlock Holmes would make quick deductions after observing small details about the person in question—something about his or her clothes, hands, or posture. Watson and the client would be astounded by his perceptive capacity, but only until he explained to them just how simple it had been to arrive at that conclusion. The client would then present his or her case, which was often a sequence of events so odd, or else seemingly insignificant, that the police would simply have laughed at it." Doyle invented Sherlock Holmes through short stories. Doyle wrote at a blistering place. He could write one story in just a few weeks. Doyle was a successful ophthalmologist before and during his writing career. "Almost ten years had passed since Conan Doyle had killed off Holmes. He was of the opinion that had he not done so, Holmes would have killed him off instead." Doyle asked for exorbitant fees from his publisher when agreeing to continue writing the stories because he wanted to be turned down so he would have a good reason to quit the series. They just kept paying him whatever he asked. Das Lesen dieses Buchs hat mir wirklich viel Freude bereitet. Nachdem ich meine Oberstufenschüler zu Sherlockianern bekehren konnte, war es wunderbar noch mehr über den genialen Detektiv zu erfahren. I am a fan of Holmes and a student of history so this book, a gift from my wife, was perfect. 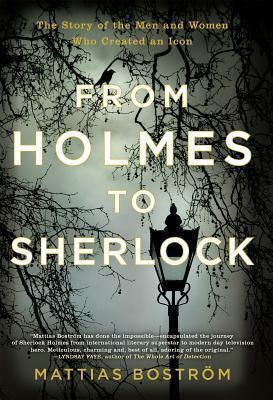 Bostrom does a marvelous job tracing Arthur Conan Doyle's life and Holmes career then taking us on a roller coaster ride as Holmes' popularity rose and fell across the years. That his children thoroughly mismanaged the estate and squandered hundreds of thousands of dollars has as much to do with thr times than basic incompetence. Aftrr all, Holmes was one of the first international figures to be exploited across media and long after the creator perished. There were no templates to follow and they did their best, or so they thought. A long time ago, when I tried to learn a little bit about Swedish culture and history—including the language—a Swedish word, lagom, popped into view. It is a complex word with a rich history that might be used to portray the essence of Swedish society. Lagom is a leveling term, weighted with senses of sufficiency, appropriateness, or “just enough.” In other words, lagom comes into play if society views you as better than the rest, an expert, or highly accomplished. No one is allowed to stick their head very far above the plane of Swedish society. Lagom won’t permit it. It is a kind of whack-a-mole cultural mentality. I’ll be the first to admit that the entire concept of lagom may be stereotypical or clichéd. My current sense of Swedishness comes from viewing episodes of Wallander on television or wondering about a girl with a dragon tattoo. But if lagom still operates in Swedish society, especially within its literary neighborhoods, then Mr. Mattias Boström better put on some padding and watch his head. He might get walloped in a big way because he’s written a book about Sherlock Holmes that is head and shoulders above anything we’ve seen lately. He may have already taken a few hits from literary compatriots and neighboring critics. From Holmes to Sherlock, the 2017 title under review here, is an English translation (and expansion, by a considerable number of pages) of the 2013 Swedish original, Från Holmes till Sherlock (Stockholm: Piratförlaget). Swedish reviewers were impressed, even as they fingered their mole mallets. Danish reviewers had their chance to whack Mr. Boström back into place—I don’t view lagom as a practice exclusively in the Swedish domain—when the Danish translation, Fra Holmes til Sherlock, appeared in 2014 (Modtryk, translated by Connie Møller Christensen). Germans got their chance to take a swing when Von Mr. Holmes zu Sherlock – Meisterdetektiv, Mythos, Medienstar appeared in 2015. This btb/Random House edition, translated by Susanne Dahmann and Hanna Granz, demonstrated another reason readers and reviewers might want to pummel Mr. Boström: he keeps revising the text. Given all the tinkering he’s done since—he continued the practice with the 2016 Norwegian edition (Quintano, translated by Ragnhild Aasland Sekne and Anlaug Lia) and now the expanded English edition, smartly translated by Michael Gallagher—Boström presents himself as both a prominent and moving target (in a good way). Tinkering aside—and we’re glad he continued to fiddle with the text—Boström accomplishes a remarkable feat in 597 pages with a style and grace that leaves one nearly speechless. In the course of 111 episodic chapters spread over eight chronological sections, he elegantly compresses 140 years of Doylean and Holmesian adventure into a transcendent tale tracing the evolution of the world’s most famous consulting detective from his first appearance on the pages of the Beeton’s Christmas Annual (1887) to his twenty-first century digital reincarnation on fanfiction platforms and in the restoration of a supposedly lost silent film. One gets a sense of the magnitude of Boström’s accomplishment by considering the following slices of the Sherlockian universe: Ronald De Waal’s magisterial four volume bibliography, The Universal Sherlock Holmes, covers the years 1887 to 1994 and lists 24,703 items. Archive of Our Own (AO3) list 105,694 creative works on Sherlock Holmes and related fandoms; all of these pieces were produced in the last decade! Together they account for over 130,000 creations inspired by the adventures of Mr. Holmes and Dr. Watson. It is as if Boström took all these works—texts, commentaries, illustrations, animations, movies, podcasts, the lot—and energetically, yet gracefully compressed them into an evolutionary narrative that allows us to comprehend the true genius of Sir Arthur’s Victorian creation—and all who have followed in his wake. Boström’s magnum opus, for that is what it is, delivers on the promise of his subtitle: a compelling story of the men and women who created an icon. Doyle’s first Sherlockian scratch on foolscap is the Big Bang of the Sherlockian universe. What Boström allows us to witness, and appreciate, is the ever expanding creative, poignant, and diverse nature of this captivating cosmos. Swedes proverbially say “Lagom är bäst,” the right amount is the best, or as it is sometimes translated “Enough is as good as a feast.” In From Holmes to Sherlock Mattias Boström stands this adage on its head. He gives us a perfect feast—far better than any moderating cultural norm. Standing high above the Sherlockian plane, Mr. Boström need not worry of being whacked back into a mole hole of critical or literary conformity. His tale is too majestic. Besides, Mr. Holmes and Dr. Watson would never allow such a thing to happen. Was kann man sich hinter dem Titel vorstellen? Es handelt sich bei "Von Mr. Holmes zu Sherlock" um einen spannend erzählten Roman über die Entstehung von Sherlock Holmes und seinen Weg zu dem Medienstar der er heute ist. Dies beginnt 1878 mit Arthur Conan Doyles Inspiration für die Figur des Sherlock Holmes und führt bis ins Jahr 2015, in dem der Roman endet. Auf den 550 Seiten über diese 137 Jahre taucht man als Leser tief in das Phänomen "Sherlock Holmes" ein und schlägt am Ende das Buch mit wahnsinnig mehr Wissen dazu zu. Zuerst einmal möchte ich das Cover und die Coverinnenseiten des Buches hervorheben. Mir gefällt das Cover unglaublich gut mit den beiden Shilouetten des klassischen Sherlock Holmes Bildes und der Sherlock Interpretation von Benedict Cumberbatch. Doch vorallem habe ich während des Lesens immer wieder zu den beiden Buchdeckelinnenseiten geblättert, da sich auf diesen wahnsinnig viele Bilder der im Buch erwähnten, wichtigen Personen befinden, und ich so immer ein klares Bild vor Augen hatte. Da während des gesamten Romanes unglaublich viele Figuren vorkommen, hat es mir immer sehr geholfen, durch die Bilder einen gewissen Überblick zu behalten. Das Buch ist tatsächlich wie ein Roman aufgebaut, obwohl es sich ja eigentlich um eine Biographie über Sir Arthur Conan Doyle und über die weitere Entwicklung der Figur Sherlock Holmes nach Conan Doyles Tod handelt. Man liest also spannende Geschichten, die alle wirklich so passiert sind und lernt auch noch einiges als Sherlockianer dazu, was eine wirklich unterhaltsame und informative Mischung ergibt. Es hat mich wirklich fasziniert, dass der Autor es geschafft hat, einen so guten Roman zu schreiben, in dem er quasi über andere sehr gute Romane schreibt. Es handelt sich bei diesem Buch wahrlich nicht um einen gewöhnlichen Schreibstil. Ich kann mich nicht erinnern, jemals einen solch frustrierend-faszinierenden Schreibstil gelesen zu haben. Der Autor beginnt dabei sehr viele Kapitel mit einer erstmal komplett zufälligen und auf den ersten Blick uninteressanten Figur, bei der ich mich oft gefragt habe: "Was soll/bringt die denn jetzt?" Doch dann liest man weiter, und die Figur bekommt ihre Geschichte und im Endeffekt eine Verbindung zu Sherlock Holmes, und einen wichtigen weiteren Einfluss für das Phänomen Sherlock Holmes. Das hat der Autor so oft gemacht, und jedesmal war ich zuerst frustriert, weil ich dachte, dass ich gerade etwas unwichtiges lese, und am Ende fasziniert darüber, wie clever der Autor die Verbindung zu Sherlock Holmes eingesponnen hat. Dass das ja auch alles reale Personen und Geschichten waren, hat mich immer wieder sehr verblüfft. So oft konnte mich dieser Schreibstil unglaublich fesseln, da das ganze so spannend geschrieben ist. Ich konnte die intensive Leidenschaft des Autors für Sherlock Holmes buchstäblich durch jede Seite lesen und war eigentlich die ganzen 550 Seiten hindurch immer wieder erstaunt wie unglaublich viel Recherchearbeit in dieses Buch geflossen sein muss. Sehr oft fragte ich mich auch bei Sachen die die Figuren machten, wie der Autor das bitte wissen könnte. Doch wenn man sich die endlos langen Quellenangaben am Ende des Buches ansieht, dann wird einem die extreme Recherchearbeit nochmals bestätigt und vor Augen geführt. Ich empfinde dafür wirklich große Hochachtung für den Autor und den Aufwand, der spürbar mit sehr viel Liebe, in dieses Werk gesteckt wurde. Ich habe definitv extrem viel neues Wissen über das Sherlock Holmes Universum durch das Buch erlangt, und vorallem wurde auch meine Lust, mehr über die Ursprünge von Sherlock Holmes herauszufinden, sehr gestärkt. Generell hatte ich während des Lesens sehr Lust, sofort die ganzen originalen Sherlock Holmes Geschichten zu lesen, und wiederzulesen und zu analysieren, etc. Auch fande ich es interessant zu lesen, welche anderen berühmten Schriftsteller zur gleichen Zeit wie Conan Doyle gelebt hatten, und welche er sogar gekannt und gemocht hatte. Durch den fesselnden Schreibstil entstaubt der Autor die Vergangenheit extrem, und schafft Zugang zu auf den ersten Blick Uninteressanten, da er die kleinen, interessanten Details hervorhebt. Wie viel zur BBC Sherlock Serie kommt im Buch vor? Das erste Kapitel, was sich sogleich mit Mark Gatiss und Steven Moffat (den Erschaffern der BBC Sherlock Serie) beschäftigt, konnte mich natürlich sofort packen und ich war sehr erstaunt, wie unglaublich nahe das Buch an der Serie dran ist, da ich erst dachte, dass Benedict Cumberbatchs Shilouette auf dem Cover eher gut für die Promotion des Buches war, und mehr nicht. Jedoch beginnt der Roman nach diesem kurzen, BBC Sherlock-Fans-lockenden Anfang, erstmal in 1878 und mit dem jungen Arthur Conan Doyle und damit, wie er die Inspiration für die Figur des Sherlock Holmes gefunden hat. Es dauert jedoch tatsächlich über 500 Seiten bis sich das Buch dann wieder mit der BBC Sherlock Serie beschäftigt. Daher beschränken sich die Seiten, in denen es um die beliebte Serie geht wohl insgesamt nichtmal auf 50 Seiten, was ich schade fande. Wenn ihr also zu dem Buch greift, solltet ihr eure Erwartungen was das Erwähnen der BBC Sherlock Serie betrifft doch ziemlich senken. Im Endeffekt beschäftigt sich das Buch doch zu 90% mit "Mr. Holmes" und sehr gering mit "Sherlock". Das stellte für mich doch einen Sternenabzug dar, da ich schon finde, dass man als BBC Sherlock Fan von dem Buch geteasert wird und dann nicht genug dafür bekommt. Auch wenn mir wirklich nie während des Lesens langweilig geworden ist, hatte das Buch doch einige Längen, die ich gerne etwas kompakter gehabt hätte. Man hätte hierbei vieles weglassen können, was am Ende ohnehin zu nichts geführt hatte. Ebenso nahm der Autor in dem Teil meiner Meinung nach auch einfach zu viele eigentlich unwichtige Figuren und Details mit rein. Hätte er diese weggelassen, wäre das Buch in dem Teil nicht so abgesackt und er hätte vielleicht mehr Seiten auf die 2000/2010er Jahre verwenden können. Auch hierbei wendete der Autor wieder sehr oft die oben erwähnte Schreibtechnik an, welche jedoch in dem Teil bei mir immer öfters zur Frustration als zur Faszinierung führte. Ich hoffte, dass die Handlung endlich voranschreiten würde und näher in die nahe Vergangenheit käme. Jedoch griff der Autor stattdessen sehr oft nochmal weiter zurück in die Vorvergangenheit der gerade beschriebenen, statt mal zügiger voranzukommen. Es wurde, wie gesagt, nie langweilig, aber doch stellenweise zu lang und ausführlich. Die letzten 50 Seiten befinden sich in der Lebzeit des Autors, weshalb der Schreibstil des Buches plötzlich umspringt, und einen Ich Erzähler freigibt. Ebenso ändert sich die Wortwahl, die sehr viel subjektiver und leicht umgangssprachlich ist. Ich war mir erst nicht sicher, was ich davon halten sollte, da ich es weder als besonders toll noch als unbedingt schlecht empfand. Im Rückblick finde ich es dennoch passend, dass der Autor, auch seine eigene Sherlock Holmes Geschichte beleuchtet hat. Leider wurde in den letzten 50 Seiten nochmal sehr viel für mich Unwichtiges erwähnt, während über die Guy Ritchie Filme mit Robert Downey Jr. und Jude Law meiner Meinung nach viel mehr hätte geschrieben werden können. Ebenso über die BBC Serie Sherlock, wie oben erwähnt. Dafür hat es mir jedoch sehr gut gefallen, dass die amerikanische Sherlock Holmes Serie "Elementary", mit Jonny Lee Miller als Sherlock Holmes, eine Erwähnung gefunden hat, da diese sonst sehr oft im Sherlock Holmes Universum ignoriert wird. Ich kann dieses Buch allen Sherlock Holmes Fans wirklich nur brühend heiß ans Herz legen, da ich unglaublich viel Spaß mit dem Buch hatte und sehr viel dazu gelernt habe. Es ist sowohl extrem informativ als auch sehr unterhaltsam, was vorallem dem spannenden und fesselnden Schreibstil zu verdanken ist. Die Schreibtechnik des Autors ist mit nichts zu vergleichen, was ich bisher gelesen habe, und allein deswegen sollte man das Buch schon lesen. Man bekommt als Sherlock Fan wunderbar viel Wissen mitgeliefert und der Roman macht wahnsinnige Lust darauf, sich noch intensiver mit allem was Sherlock Holmes betrifft auseinanderzusetzen. Ich war bereits nach den ersten Seiten begeistert und durch die gesamten 550 Seiten hindurch nie gelangweilt. Dadurch dass es durchwegs so gut geschrieben ist, las ich immer mehrere Kapitel am Stück und hatte sehr oft das klassische "Just one more chapter.." Problem. Ich empfinde große Hochachtung dem Autor gegenüber, für die immense Recherchearbeit die in das Entstehen dieses Buches geflossen ist. Tatsächlich war ich mir bereits nach einigen Seiten und auch während der kompletten ersten Hälfte des Buches sicher, dass ich diesem Buch 5 von 5 Sternen geben würde, da ich einfach so wahnsinnig begeistert davon war. Da ich aber doch enttäuscht darüber war, dass die neuesten Ereignisse zu Sherlock Holmes nur sehr oberflächlich angeschnitten wurden, und vorallem nicht mehr zur BBC Serie Sherlock kam, musste ich wieder einen Stern abziehen. Bekräftigt wurde das auch dadurch, dass ich extrem lange an dem Buch gelesen habe, nämlich einen ganzen Monat. Dies lag vorallem auch an der etwas langatmigen zweiten Hälfte des Buches, in welcher sich der Autor zu sehr im Unwesentlichen verlor, weshalb sich das ganze doch etwas zog. Dennoch kann ich das Buch wirklich extrem empfehlen, wenn man sich für Sherlock Holmes und dessen Entstehung, Verbreitung und Geschichte interessiert. Ich verleihe diesem Buch 4 von 5 Sternen. Sherlock Holmes is one of the most well-known literary figures of modern literature. He is one of those characters that needs no explanation, and whose shadow and legacy goes before him instead of behind. I am a big fan of the BBC Sherlock series, as well as the original books themselves, so I was excited to read this exploration of Holmes, Conan Doyle and Sherlockmania in general. The book starts with a biography of Conan Doyle himself, then moves into an account of the continuing publication an Sherlock Holmes is one of the most well-known literary figures of modern literature. He is one of those characters that needs no explanation, and whose shadow and legacy goes before him instead of behind. I am a big fan of the BBC Sherlock series, as well as the original books themselves, so I was excited to read this exploration of Holmes, Conan Doyle and Sherlockmania in general. The book starts with a biography of Conan Doyle himself, then moves into an account of the continuing publication and movie/TV history of Sherlock and Watson. The research that must have gone into this book is absolutely phenomenal, and the tone is very atmospheric. Bostrom does a great job of handling this book as nonfiction, but still places segments of fictional narrative for ambience. A marvellously written book about the creation of Sherlock Holmes, how he outgrew his authors control and became an early icon for modern day pop culture. It could have easily been a very dry non fiction account, butBoströms literary prose gives life to the events and the men and women who through different medias helped shaping our perception of the consulting detective. A must read for anyone with even the remotest interest in pop culture and how ourcollectuve imagination helps shaping beyond t A marvellously written book about the creation of Sherlock Holmes, how he outgrew his authors control and became an early icon for modern day pop culture. It could have easily been a very dry non fiction account, butBoströms literary prose gives life to the events and the men and women who through different medias helped shaping our perception of the consulting detective. This is an interesting book for devout Sherlock Holmes fans who want to learn the entire history of that famous detective. Boström's book details an impressive scope of information with engaging prose. Personally, I felt that the last third of the book dragged on a bit. Overall, it was worth the read. Dense, imaginative, meticulously researched, with 40-plus pages of Sources and a bibliography nearly as long. Occasionally meandering but never dull; an excellent read for anyone intrigued by the persistence of Sherlock Holmes. Fascinating look at Doyle's life, the creation of Holmes, the squabbles among his ne'r do-well sons for copyright, money and folly that they created in their greed and foolishness. From the time Sherlock Holmes was created, the world has been fascinated. Over one hundred later, the public still can't get enough of the great detective. This book starts from the moment Arthur Conan Doyle conceived the idea of a story about an unusual and observant detective, and then follows those who had an influence in bringing Sherlock Holmes through the ages. At times, it seems like the telling drags a little with too much information about the lives of those who had a hand in crafting an From the time Sherlock Holmes was created, the world has been fascinated. Over one hundred later, the public still can't get enough of the great detective. At times, it seems like the telling drags a little with too much information about the lives of those who had a hand in crafting and promoting Sherlock Holmes, but those details really bring to life what an impact the detective had on so many people. 'From Holmes to Sherlock' was an interesting read, combining biography of the characters and Conan Doyle himself. It dragged slightly in places and was occasionally difficult to follow the narrative as it flitted from subject to subject. Even so, the book is a comprehensive account of Sherlock Holmes and his fans and I did enjoy reading it. Manchmal bedarf es der Neuinterpretation eines Klassikers durch ein Filmprojekt, um eine literarische Figur neu zu beleben und wieder in unseren Fokus zu rücken. So geschehen im Fall „Sherlock Holmes“, der durch die Drehbuchautoren der neuen BBC-Serie Steven Moffat und Mark Gatiss entstaubt und in einen modernen Kontext gebracht wurde. Nicht zu vergessen den Hauptdarsteller Benedict Cumberbatch, der maßgeblich Anteil an dem Erfolg hatte. Dadurch wurde auch das Interesse der Leserschaft an der tr Manchmal bedarf es der Neuinterpretation eines Klassikers durch ein Filmprojekt, um eine literarische Figur neu zu beleben und wieder in unseren Fokus zu rücken. So geschehen im Fall „Sherlock Holmes“, der durch die Drehbuchautoren der neuen BBC-Serie Steven Moffat und Mark Gatiss entstaubt und in einen modernen Kontext gebracht wurde. Nicht zu vergessen den Hauptdarsteller Benedict Cumberbatch, der maßgeblich Anteil an dem Erfolg hatte. Dadurch wurde auch das Interesse der Leserschaft an der traditionellen Figur und ihrem Schöpfer neu entfacht, sodass im Nachgang zahlreiche Publikationen sowohl im Belletristik- als auch im Sachbuchbereich auf den Markt kamen, die den englischen Meisterdetektiv zum Thema haben. Der Schwede Mattias Boström ist ein ausgewiesener Holmes-Experte und hat als Mitglied der „Baker Street Irregulars“ bereits zahlreiche Aufsätze zum Thema veröffentlicht. Für sein populär-wissenschaftliches Buch „Von Mr. Holmes zu Sherlock“ (in der deutschen Übersetzung von Susanne Dahmann und Hanna Granz, erschienen bei btb) wurde er mit dem Schwedischen Krimipreis Sachbuch ausgezeichnet. Boström nähert sich dem Thema von der historischen Seite, wobei er anfangs sein Hauptaugenmerk auf Arthur Conan Doyle, Kleinstadt-Arzt und Schöpfer des berühmten Detektivs, richtet. Unterteilt in sechs zeitlich gegliederte Kapitel, beginnend 1878 und 2015 endend, zeigt er nachfolgend aber auch die Einflüsse von Illustratoren, Redakteuren und Schauspielern auf. Jeder von ihnen hat durch seine individuelle Interpretation Sherlock Holmes im Laufe der Zeit Stück um Stück verändert, sodass diese literarische Figur allmählich eine Eigendynamik entwickelt hat, die es für so manchen Leser schwierig macht, zwischen Dichtung und Wahrheit zu unterscheiden. Wie sonst ließe sich das ungebrochene Interesse an Holmes erklären, das alljährlich Tausende von Besuchern in London auf seinen Spuren wandeln lässt? Akribisch genaue Literaturverweise , allgemeine Quellenangaben, eine Auflistung der Werke Conan Doyles und ein ausführliches alphabethisches Register runden dieses Sachbuch ab und zeigen auf, dass sich der Autor über Jahre hin sehr intensiv mit diesem Thema beschäftigt haben muss. Aber auch der interessierte Laie findet hier genügend Anstöße für eine weiterführende Lektüre. Und so ist „Von Mr. Holmes zu Sherlock“ eine wahre Fundgrube für all diejenigen, die sich der Faszination dieses literarischen Phänomens nicht entziehen können. Det her er en bog, som jeg var lidt i tvivl om. Jeg har (endnu) ikke læst Conan Doyle’s værker, så ville den her bog spoile alt for mig? Jeg ved allerede en masse, men bøgerne er jo gamle og det er min egen skyld, jeg ikke har læst dem endnu, så det kan jeg ikke rigtig klage over. Men at sætte mig ned og bevidst afsløre det for mig selv? Det gad jeg ikke. Og sådan blev det da heller ikke. Der var selvfølgelig visse afsløringer i forhold til de oprindelige værkers handling, men ikke mere, end hva Det her er en bog, som jeg var lidt i tvivl om. Jeg har (endnu) ikke læst Conan Doyle’s værker, så ville den her bog spoile alt for mig? Jeg ved allerede en masse, men bøgerne er jo gamle og det er min egen skyld, jeg ikke har læst dem endnu, så det kan jeg ikke rigtig klage over. Men at sætte mig ned og bevidst afsløre det for mig selv? Det gad jeg ikke. Og sådan blev det da heller ikke. Der var selvfølgelig visse afsløringer i forhold til de oprindelige værkers handling, men ikke mere, end hvad jeg tror, de fleste allerede godt ved. Det er en fagbog skrevet i skønlitterært sprog. Det betyder, at jeg måtte stoppe op undervejs og huske mig selv på, at det faktisk var en rigtig historie og ikke bare fiktion. Det var så let at glemme. Og det er absolut til bogens fordel. Den er utrolig videnstung og rummer rigtig mange informationer på hver eneste side, men det bliver aldrig tørt eller kedeligt, men formår at forblive spændende og let. Bogen tog mig en rum tid at læse, i forhold til hvor glad for den jeg var, men igen, den var meget videnstung. Der optræder utrolig mange navne, som man skal have styr på, fordi de senere i bogen får en vigtig betydning, og man skal derfor helst kunne huske nogenlunde, hvem de er. Det var ikke et problem, hvilket egentlig kom som en overraskelse for mig, fordi jeg jo ellers ikke er særlig god til navne. Bogen handler om, hvordan Doyle i sin tid fik idéen til Sherlock Holmes, og hvordan han (Holmes) har udviklet sig til det han er i dag. Det er virkelig interessant! Det var ikke alle dele i bogen, jeg fandt lige interessant, og derfor var den svær at give en karakter. Jeg har alligevel valgt topkarakter, for selvom jeg ikke var lige begejstret over alle dele af bogen, så er de med til at vise, hvor grundig en bog det her er. Det føles måske mindre relevant, men viser den grundighed Boström har lagt i det. Den er virkelig gennemarbejdet. En svær bog at anmelde, fordi der simpelthen er så mange ting at tage fat på. Alle, der har bare den mindste interesse i Sherlock Holmes, bør læse den her bog! Part 1, a biography of Arthur Conan Doyle focused mostly on his creation of Sherlock Holmes, was an interesting, if a bit sparse read. I was expecting more on his inspiration for each of the stories, but it could just be that the information isn't available (as the book goes into later, Doyle's collection of papers was only made available for researchers very recently). It dispels some myths, such as that Joseph Bell was the inspiration for the character when in reality Doyle witnessed Bell's methods and mannerisms and extrapolated them into a wholly-original detective character, and overall this section was enjoyable. Part 2, the middle third of the book, focuses a lot on Doyle's children and their various attempts to capitalize on the character in order to fund their eccentric or extravagant lifestyles. This section seriously dragged, especially since I don't have as much personal experience with the Basil Rathbone movies, and I remember finding the John Gielgud radio drama that I listened to as a kid pretty dry and dull. This section also gets into the origins of the various Sherlockian societies, which got a lot of mostly-unimportant exposition (most likely because there is a lot of information about the Sherlockian societies, since most of their main work has been publishing scholarly articles and books). Part 3 was the most interesting to me, because it focused on the Holmes adaptations that I was most familiar with: the Jeremy Brett adaptations, Disney animated film The Great Mouse Detective (my childhood introduction to Sherlock Holmes, even if I didn't know it at the time), the Robert Downey Jr. movies, and the modern day Sherlock and Elementary series. Mattias Boströms „Von Mr. Holmes zu Sherlock: Meisterdetektiv. Mythos. Medienstar“ fing richtig, richtig vielversprechend an: Mit einem ausführlichen biographischen Abschnitt über Sir Arthur Conan Doyle und darüber, wo der Autor die Inspiration für seinen berühmten Meisterdetektiv fand. Der „Mr. Holmes“-Part wurde damit ausführlich abgedeckt. Der Teil, der sich mit Sherlock und dessen Dasein als Medienstar auseinandersetzt, konnte mich dann aber nicht mehr überzeugen. Wie schon gesagt, der erste Tel des Buchs konnte mich wirklich überzeugen, der Autor schildert sehr anschaulich, wie Conan Doyle lebte und woher er seine Inspirationen zum Schreiben genommen hat und das ist schon wahnsinnig interessant, denn der Arzt und Autor hat schon ein ziemlich interessantes und spannendes Leben geführt. Das gleiche gilt auch für seine Söhne, denn auch die Nachfahren Conan Doyles und deren Leben werden ausführlich beschrieben. Irgendwann allerdings fängt der Autor an, sehr nach Fanboy zu klingen, die Sprache wird immer kindischer und der seriöse Anstrich, der gerade im ersten Teil noch vorhanden ist, geht irgendwie völlig verloren und auch sonst wirkt das ganze nicht mehr so überzeugend, wie das anfangs der Fall war. Ich hatte auch das Gefühl, dass der Autor am Ende die ganzen modernen Inkarnationen von Sherlock Holmes relativ schnell abhandelt und dabei einen sehr subjektiven Fokus setzt, der mit meinen Interessen nicht wirklich übereinstimmte. Ein bisschen wirkte es auch, als wären ihm am Ende die Seiten ausgegangen.